photo-electro-chemical chain, by the same mechanism and in the same order to absorb energy from the sun. Similarly; all the cells of our bodies, or the cells of any animal, perform also the same unique chain of reactions, but in the opposite direction, to release the absorbed solar energy. So, there is a unique cycle, formed of two similar but oppositely directed processes, which are performed by the green leaves and the cells of any living organism to keep the life-continuation on our planet. The sun represents the sole source of energy to our earth and for our life and its energy is delivered to the cells of our bodies by such miraculous cycle though the green leaves. So, the continuation of our life depends on the sun and the plants to get the required energy to live. Who did design such UNIQUE Cycle formed of such UNIQUE chains? How is it arranged such UNIQUE cycle into two different biological kingdoms; the animal and plant kingdoms? In Islam, we believe in One God, who has no son or similitude, and we have a unique Book, the Quran, a unique messenger, Mohammad, a unique Path, the straight Path, a unique direction, the Quabba, a unique nation, Islamic nation, etc..
036.077 Doth not man see that it is We Who created him from sperm? yet behold! he (stands forth) as an open adversary! 36.078 And he makes comparisons for Us, and forgets his own (origin and) Creation: He says, "Who can give life to (dry) bones and decomposed ones (at that)?" 036.080 "The same Who produces for you energy (fire) out of the green tree, when behold! ye kindle therewith ! 036.081 "Is not He Who created the heavens and the earth able to create the like thereof?" - Yea, indeed! for He is the Creator Supreme, of skill and knowledge (infinite)! 036.082 Verily, when He intends a thing, His Command is, "be", and it is! 036.083 So glory to Him in Whose hands is the dominion of all things: and to Him will ye be all brought back. These verses from the 36th chapter of the Holy Quran discuss the violation of the statements of the atheists who deny the Day of Resurrection. These verses offer the evidence of God’s ability to accomplish such resurrection. Firstly; the Creator who arranged the birth of such human beings for the first time from a sperm (al half cell from the male and another half from the female) is surely able to arrange their transplanting from a remaining cell in the Day of Resurrection. Secondly; as the verses state; the Creator who arranged for our life the sole source of energy on the earth from the uniquely created green colored leaves of any plant (or tree) is surely able to resurrect such human beings in the Day of Resurrection. Thirdly; the Creator who created this infinitely organized universe formed of nicely ordered heavens and an accommodating earth is surely able to create the like or resemblance of each one of us in the Day of Resurrection. I may discuss only, as an energy specialist, the second underlined evidence or verse. Such verse points to the greatness of God’s ability that arranged for us the PRODUCTION of energy from GREEN TREES. Scientific knowledge is the tool to find God’s wisdom in such verse. We gained such knowledge through our gifted ability to learn in a created brain of limited range of thinking. As our eyes have a limited range of sight and our ears have a limited range of hearing, our brains have also a limited range of knowledge or understanding. We are able to grasp some knowledge of what may be happened in a fuzzy sense only. But what is actually there; we are not sure of. So, let us try to understand what is done in the green leaves. Such verse points miraculously to the essential process that determines our survival which is performed by “GREEN” PLANTS only. Such pointed unique color in all “Green” plants is the basis of all life on Earth. Such green pigment of the plants, Chlorophyll, is common to all photosynthetic-plant cells, which convert the solar energy into chemical energy. Such conversion process is called the photosynthesis. It is a chain of reactions, photo-electro-chemical chain, which determines the survival of our life on the earth. Such chemical energy, absorbed from the sun during photosynthesis, is used as nutrition not only by the green plants themselves but also, for example, by the human beings and all living organs on the earth. The energy required for life processes is liberated in the combustion of such formed nutrients in the cells of any living organ. This process continues indefinitely due to the fact only that the nutritional substances used up are re-manufactured in the photosynthesis of green plants. In such photosynthesis process; the plants use solar energy to build up the complicated nutritional substances from two simple molecules, carbon dioxide and water, with concomitant liberation of oxygen. In the respiration in the cells of living organisms this absorbed energy is released and the nutrition is then reconverted to carbon dioxide and water by the liberated oxygen, so that there is a continuous cyclic process performed by the green plants and the living cells. 1. How the nature may arrange such unique color, unique system, unique cycle, unique chain, unique reversing of such chain, unique mechanisms, unique order, etc..? 2. 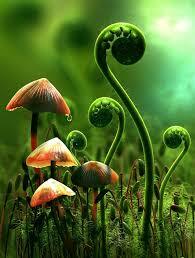 Why the nature did not offer different mechanisms for each plant and each animal? 3. How the nature may design such complicated chains, mechanisms, centers, systems, reactions, etc..? 4. Why we cannot find different natural selections by different colors, different chains, different systems, different orders, different mechanisms, etc..? 5. Who arranged the solar spectrum, the atmospheric pressure and temperature, the biosphere composition, the balance of the plant and animal kingdoms, the raining water and the earth spinning to act into a UNIQUE system? 6. Can a mindless nature design by any selection pressure such two opposite chains of reactions to keep the balance of Oxygen and Carbon dioxide and to deliver back the absorbed solar energy? 7. Can a mindless nature design such complicated centers in the leaves and the cells to perform such complicated functions UNIQUELY in all cells and leaves? The cells in the interior tissues of the green leaves, called the mesophyll, may contain between 450,000 and 800,000 unique mechanisms, called chloroplasts, for every square millimeter of leaf. The surface of the leaf is uniformly coated with a water-resistant waxy cuticle that protects the leaf from excessive evaporation of water and decreases the absorption of ultraviolet or blue light to reduce heating. The transparent epidermis layer allows light to pass through to the palisade mesophyll cells where most of the photosynthesis takes place. So, every “green” plant you see is working to convert the energy of the sun into sugars. Such plants form sugars as a source of energy for all living cells, and the byproduct of that process is the oxygen that we breathe. That process happens in the chloroplast. There are in the human and animals cells structures, called the Mitochondrion, which work in the opposite direction and break down the sugars and nutrients that the human or animal’s cell receives. Such Mitochondria is a membrane-enclosed organelle found in the human or animal cells. These organelles range from 0.5 to 10 micrometers (μm) in diameter. Mitochondria are sometimes described as "cellular power plants" because they generate most of the cell's supply of adenosine triphosphate (ATP), used as a source of the chemical energy. In addition to supplying cellular energy, mitochondria are involved in a range of other processes, such as signaling, cellular differentiation, cell death, as well as the control of the cell cycle and cell growth. Briefly, there are scientific obstacles in understanding such essential chain of reactions which is performed during the photosynthesis. However; we find photosynthesis of the plants and respiration of human beings are associated with the same chain of reactions but in opposite directions through similar structures of reaction centers. Many scientists, in chemistry and physics have been awarded the Noble Prizes to their efforts in discovering such reactions. Photosynthesis is explained into two stage processes. The first process is the Light Dependent Process (Light Reactions), which requires the direct energy of light to make energy carrier molecules that are used in the second process “The Light Independent Process (or Dark Reactions).” Such process occurs when the products of the Light Reaction are used to form C-C covalent bonds of carbohydrates. The Dark Reactions can usually occur in the dark, if the energy carriers from the light process are present. Recent evidence suggests that a major enzyme of the Dark Reaction is indirectly stimulated by light, thus the term Dark Reaction is somewhat of a misnomer. The Light Reactions occur in the grana and the Dark Reactions take place in the stroma of the chloroplasts. So, plants may be viewed as carbon sinks, removing carbon dioxide from the atmosphere and oceans by fixing it into organic chemicals. Plants also produce some carbon dioxide by their respiration, but this is quickly used by photosynthesis. Plants also convert energy from light into chemical energy of C-C covalent bonds. Animals are carbon dioxide producers that derive their energy from carbohydrates and other chemicals produced by plants by the process of photosynthesis. According to the nowadays scientific trials to understand what may be done in our cells; we look at the available fuzzy explanations. In respiration as well as in photosynthesis, electrons fall from a higher to a lower energy level, somewhat like an electric current. They do not, however, pass through an electric wire but are transferred between a number of complicated proteins, which often contain metals, e. g. iron. The principles of electron transfer between simple metal compounds have been analyzed in some detail by Henry Taube, the Nobel Prize winner for chemistry in 1983. An important goal in the chemical research of today is to extend these contributions in order to explain the more complicated biochemical processes that happened in such chloroplasts. The proteins mediating the electron transfer are organized in large molecular aggregates which are bound to biological membranes. In the electron transfer energy is liberated, and this is used to make ATP, the universal energy storage molecule of living cells. The ATP formation takes place according to a mechanism formulated by the Nobel Prize winner for chemistry in 1978, Peter Mitchell. For a long time it has been impossible to prepare membrane-bound proteins in a form allowing the determination of the detailed structure in three dimensions. I will not go to further scientific details. But the main conclusion is: Such UNIQUE GREEN Cycle, pointed in the stated Quran’s verses and operated by all GREEN Plants and all LIVING Cells, is Designed and Operated by ONE CREATOR who sent such Quran. 056.071 Do you see ye the released unseen-fire (in your cells)? 056.072 Is it ye who grow the tree which feeds such fire (as an energy source), or do We grow it? 056.073 We have made it a memorial (of Our handiwork), and an article of comfort and convenience for the supply of power. In the following verse we may read such balance of plants and animals functions is created by God not by nature. 015.019 And the earth We have give it the full extension; set thereon mountains firm; and produced (planted) therein all kinds of things in due balance. 067.003 He Who created the seven heavens one above another: No deviation in the Uniqueness wilt thou see in the Creation of (God) Most Gracious. So turn thy vision again: seest thou any flaw? Could any man write such verses since more than 14 centuris?